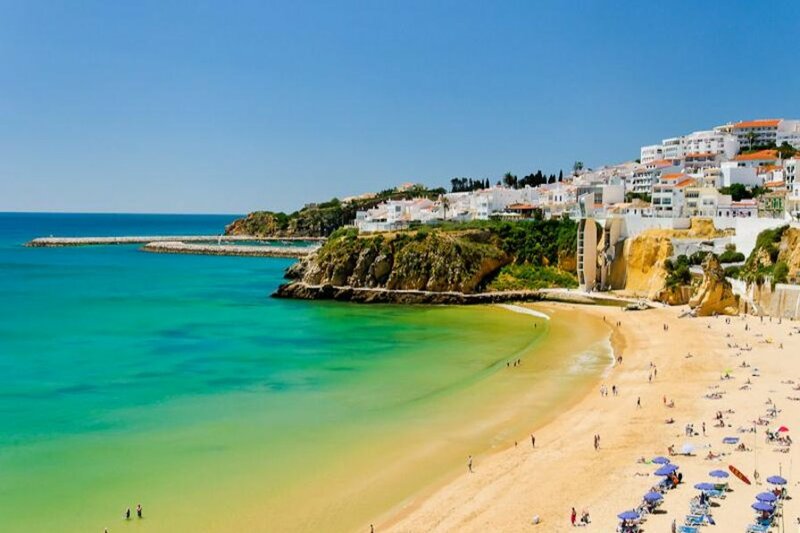 South facing Apartment overlooking seafront in Albufeira. Seconds from the beach. Shops & Restaurants on the door step, minutes from the famous 'Strip' & 'Oura' area. Beside Praia da Alemeas, Praia da Forte Sao Joao at the East side of Albufeira Beach. Praia da Aveiros (Secluded small cove) Praia da Oura (busy with all water sports & restaurants). Walking along the main beach for about 15 mins to the 'Old Town' where beautiful cobbled streets and restaurants awaiting discovery. Just outside the complex we have a little bar with a little pool, nice for cooling off on summer days, they also serve food. On the way to the 'Strip' there are a number of Facilities: A local Portuguese Resturant where there is 'Fado' (traditional Portuguese music) weekly. A small convenience store selling essentials, Kiss Nightclub (we do not hear any noise as we have a nice long well lit private driveway). At the top of the road there are a further 3 bars, cafe, Ticket Shop for Excursions and a Newsagents selling English papers and Magazines. Next door is the Auramar hotel where there is a Piano Music nightly and during High Season a selection of Entertainment that non-residents can partake in. Football is available in most bars and some restaurants round the area. At all the Beaches there are restaurants and Bars open during the day. When you leave the property by the Beach Gate, down the hill follow the road round the Monica Isabel Hotel and up the hill there are a selections of restaurants, bars, Hairdresser, Spa and Convenience Store. Nearby there is a Hotel Forte Da Vale which has an indoor pool, Sauna, Steam Room, Gym, Selection of Classes and Beauty Treatments. Temporary membership can be had either daily, weekly or longer for a reasonable fee. The BBQ is in a separate area so the smells/sounds do not detract from other Apartment Residents enjoyment.